Quadcopters UDI U818A and Syma X5C are the two best selling RC drones, which have multifaceted use and come with some smashing features. When we go digging into the Udi U818a vs Syma x5c comparison list it unveils a new horizon of unmanned flying into the real space. 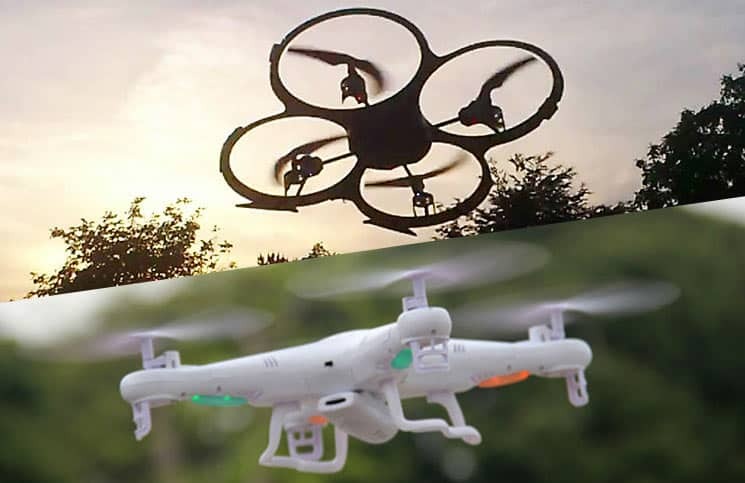 Comparing UDI U818A vs Syma X5C, we discover the changing role of drones in today’s life and also how it has evolved in finding its applicability. 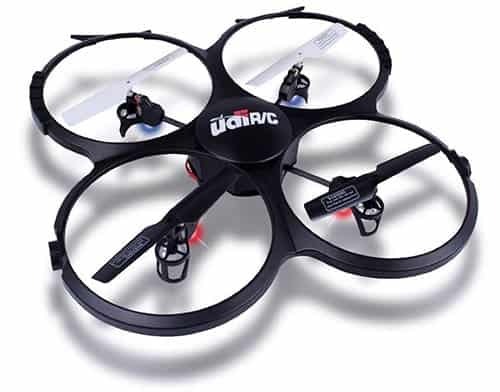 But before we head on to the udi u818a vs Syma X5C bout, let us delve into the germination of this wonder product called drones and its various uses. The earliest use of drones dates back to 1849 when it was deployed for military use. But since then there is a huge shift in the terms of technology as well as its employability. There is much more to a UAV than just for a military use or as a toy. With changing times and evolving technology, there is no field which has remained untouched and so is with the world of flying copters. The advent of remote controlled copters or drones has opened new avenues and completely revamped the scope of unmanned flying. Drone or simply UAV has created its own place and significance in the areas like reconnaissance, aerial imagery, spying, combat scenario, research and development, aid to civil authorities during calamities, Sports photography and even in carrying out armed attacks. The models have graduated from just a single rotor aircraft to more stable and reliable quadcopters. Quadcopters are drones, which have instead of one, four, propelling rotors and have a more stable flight. This model encompasses most of the features of high quality quadcopters and can be considered for both indoor and outdoor flights. Equipped with professional features it has found its domain majorly in the recreational area. This flying bird can make a 360 degree flip and has a 3d flight. With a flying time of 6-9 minutes, this machine is a hot favorite of buyers. Syma X5C is an extremely light weight drone because of which it can be comfortably used for indoor flight, but on a windy day it poses difficulty in outdoor flying. But in a light wind scenario, it is great fun to maneuver this helicopter and achieve a stable flight. Both the models have plastic exteriors which are sturdy and safe. These are designed to handle obstacles and crashes. While Udi u818a has great sustenance for outdoor flying and of course indoor flying; it can tackle strong winds and even bear impacts from obstacle while flying without any damage. The rotors are well protected in the individual circular rings which not only offer safety features from obstacle while flying, but also give a great look to the quadcopter. Comparatively, Syma x5c is a light weight drone which is excellent for indoor flights, but finds difficulty in offering a stable outdoor flight on a windy day. But then there are different modes to handle the severity of the winds. Syma x5c has drop gorgeous looks accentuated with the white exteriors and dual LED lights. It has well designed sleek model which keeps the machine safe during on flight obstructions, but it is still recommended to buy an extra set of propellers as comparatively this model is more prone to damage due to its all white exteriors. 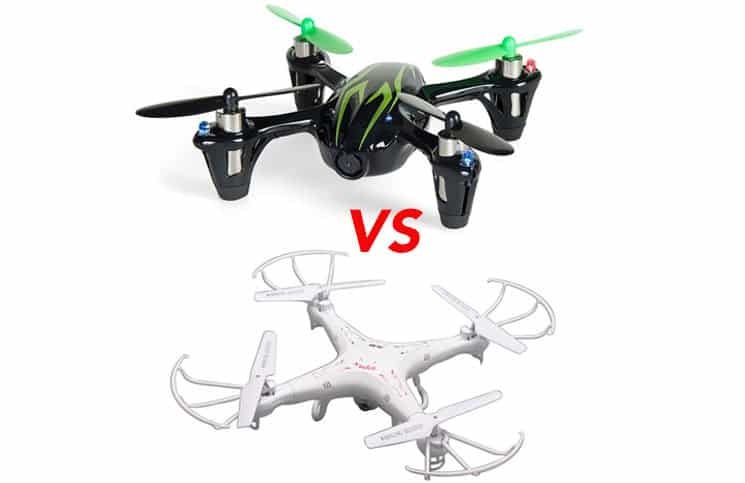 Comparing UDI U818a vs Syma X5C, both the models offer a stable flight with six axis gyro and they are equipped with a four 2.4 GHz 4 channel remote control. Both the models are capable of carrying out 360 degree flip during flight, which establishes them as far as on flight stability is concerned. They even have the capability of 3D flight. Due to six axis gyro system which itself offers a well balanced flight not much external input is required during flying which means easy operation of the remote. Both the quadcopters have excellent maneuvering ability and their flight is a treat to watch. As far as flight time is concerned in UDI U818a vs Syma X5C, the former one offers a marginally better drone flight time with 7-9 minutes and Syma X5C almost there with 7-8 minutes. Although technically speaking they both have the same battery, but charging time differs considerably with UDI U818a taking almost 120 min, whereas Syma X5C giving you a charged battery in 45 min! Therefore, it is recommended to buy two extra sets of batteries for uninterrupted fun. Both the models are equipped with a camera which is an amazing feature at this price. The camera is capable of taking still pictures as well as videos which can be easily transferred to the PC or saved in the external storage provided with the machine. The camera in Syma X5C is detachable which can be easily removed for a more stable flight, whereas in UDI U818a it is fixed.